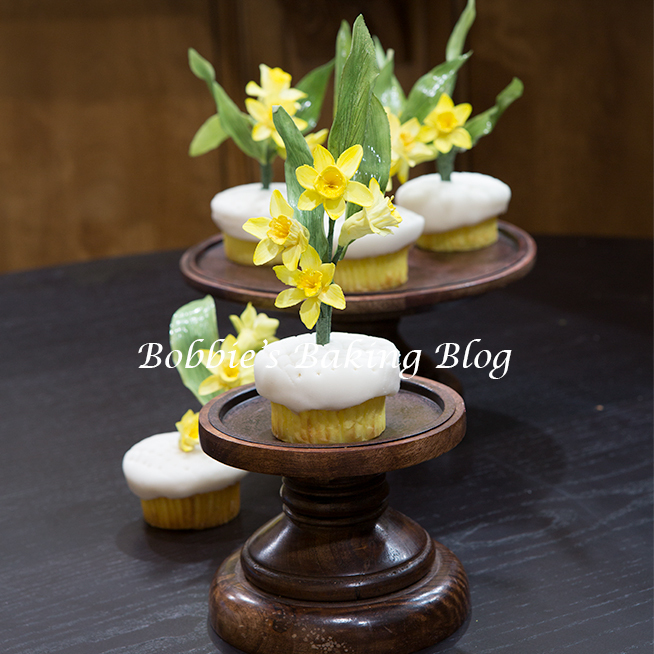 Sydney and I were asked to create Daffodil cupcakes for a wedding, the daffodil happens to be the bride’s favorite flower.The bride, Tara wanted cupcakes in lieu of a traditional wedding cake, I must admit this was the first wedding Sydney and I prepared cupcakes for as an alternative to a cake. 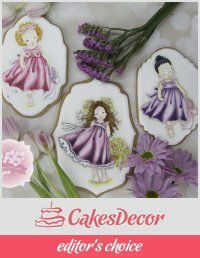 I suggested we in conjunction with the cupcakes create a small cake for the bride and groom to cut and feed each other the traditional bite. 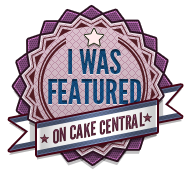 Tara loved the idea! 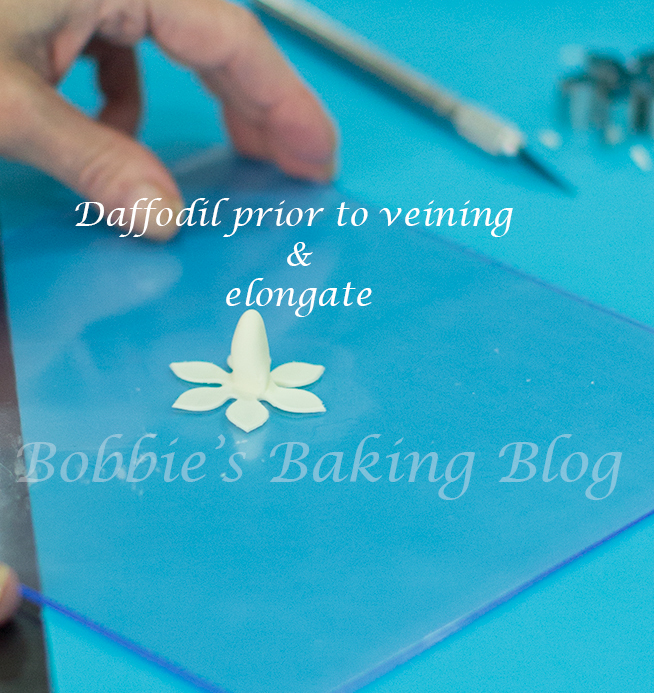 A few little guide lines to help your daffodils be a success: Always prepare extra due to how fragile the dry gumpaste becomes breakage is inevitable, DF accidental broke a petal and two leaves helping us carry the floral box they had been drying on. 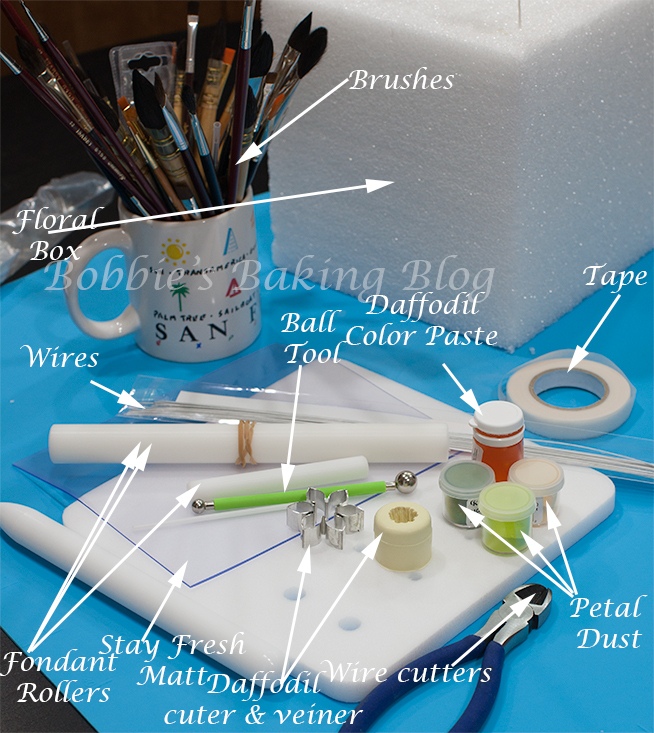 Have all your supplies ready before beginning, sketch your design, luckily Sydney is quite the artist, if possible buy a floral arrangement of the flower you are going to be creating (having a live visual aids you in having the flower look real), relax and have fun!! 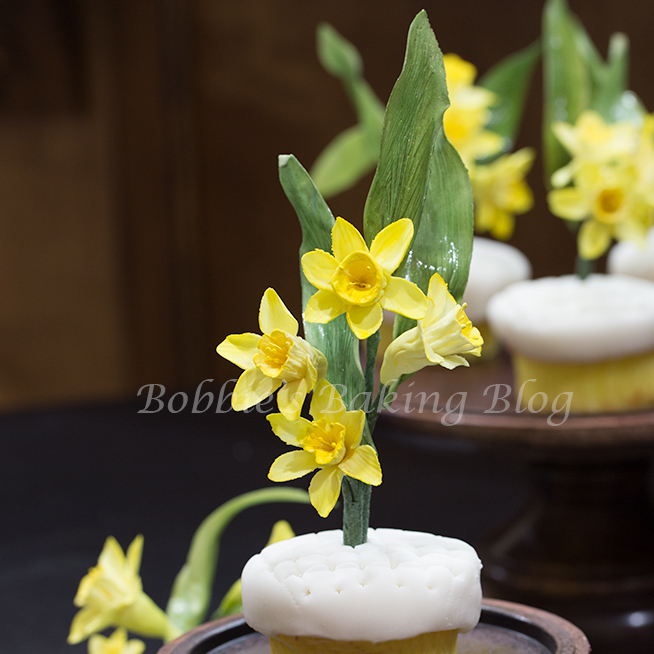 Sydney and I wanted to share the steps of gum paste daffodils with you so we prepared a few extra cupcakes. 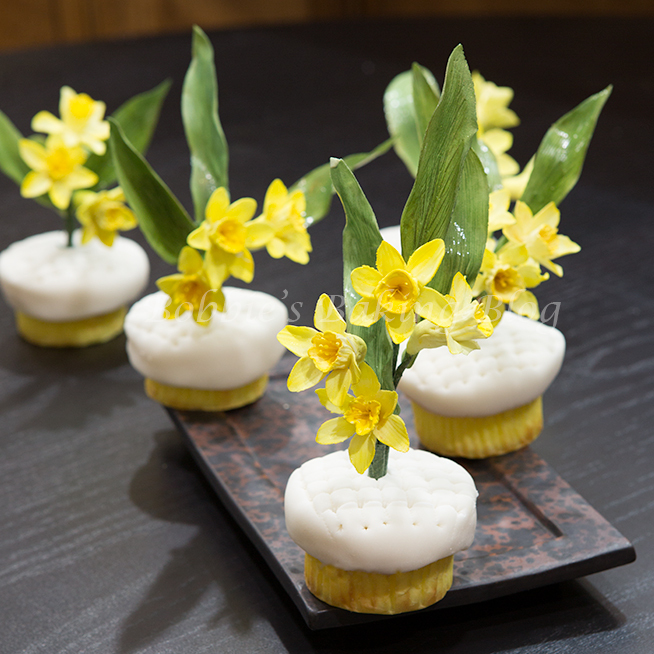 Although they are not decorated the same as Tara’s wedding cupcakes the daffodils are the exactly like the ones that adorn her cupcakes and small cake. 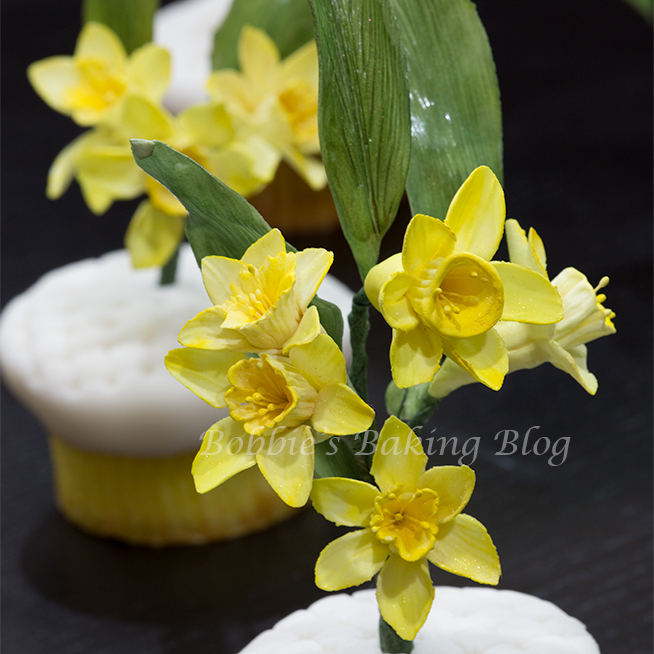 Daffodils consist of a trumpet (the centre) with six stamens in the middle, six petals surrounding the centre, and long linear deep green leaves with a hue of chestnut color. 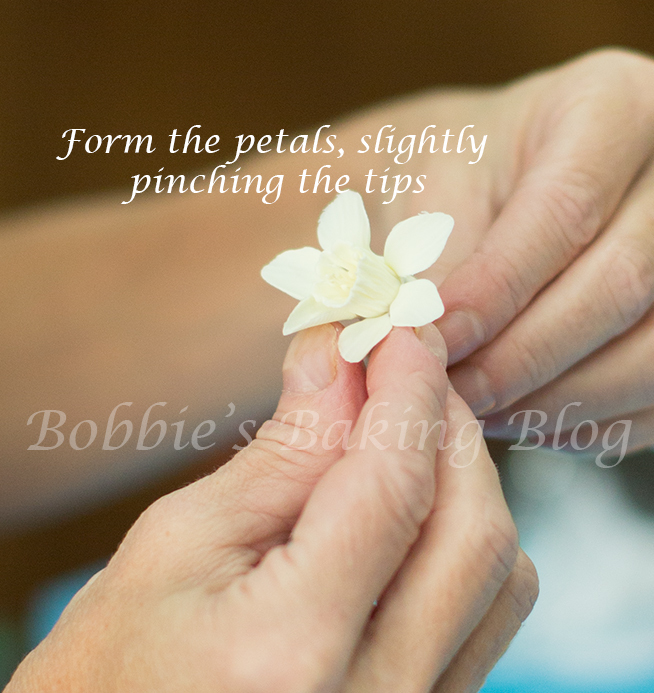 Start by preparing the stamens for all the daffodils you plan to design. 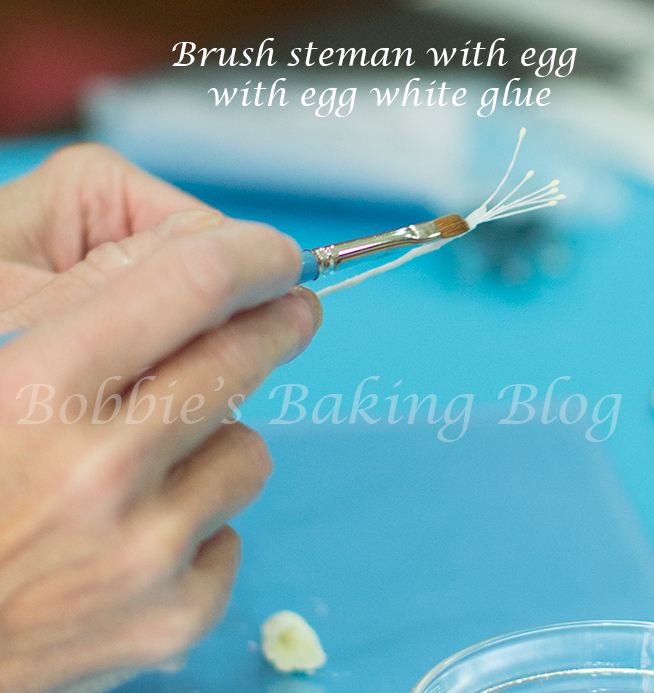 The stamens we used had yellow balls on the top and bottom, so we folded 3 of the stamens in half to have six, placed the white wire in the center and succored with white floral tape. 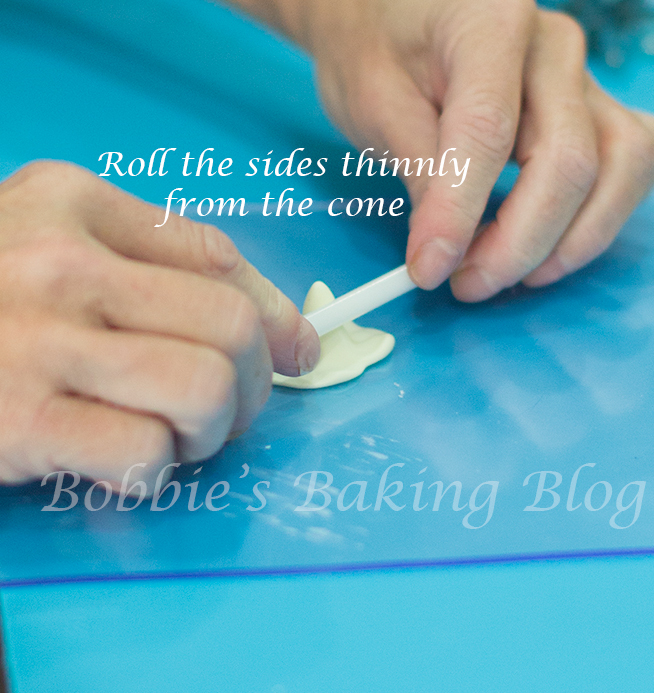 * They become sticky as you pull, gentle pull and wrap with the floral tape. 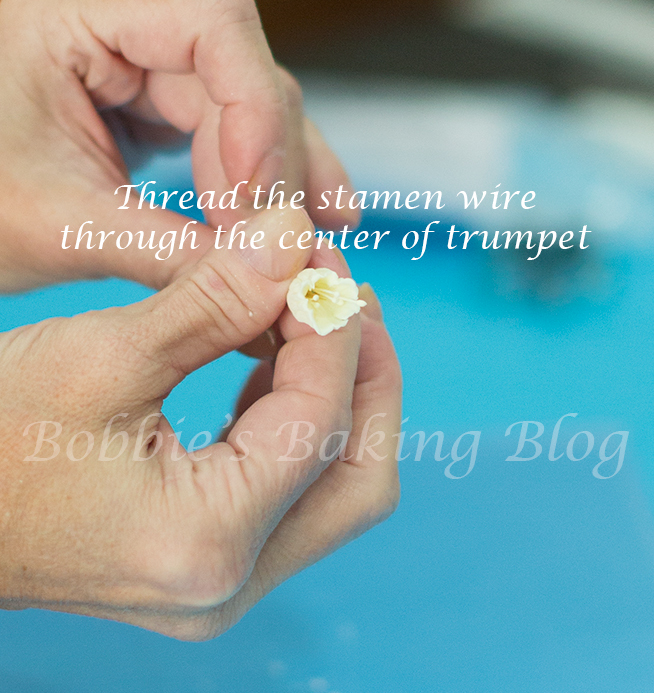 Take the stamen floral wire brush with egg white or edible glue (both sydney and I prefer using egg whites) and gingerly thread the wire up the trumpet, and pinch the bottom to attach to the wire. 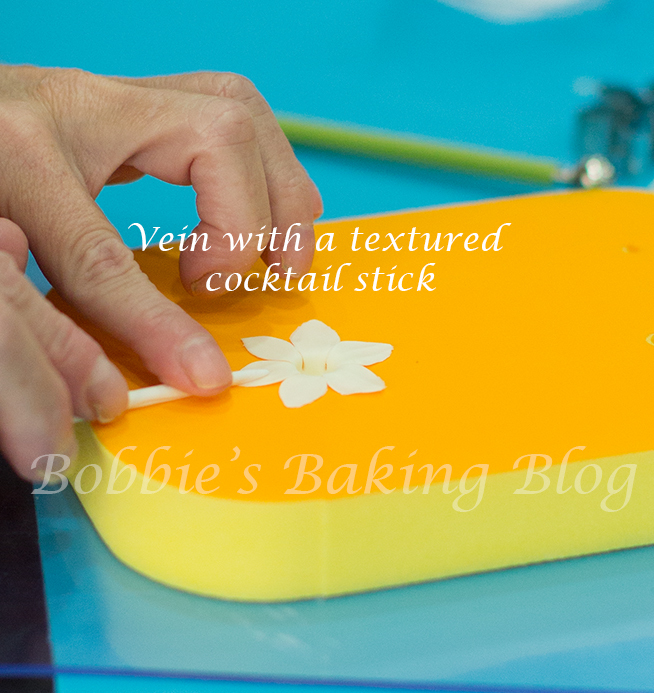 Let dry in a floral foam. 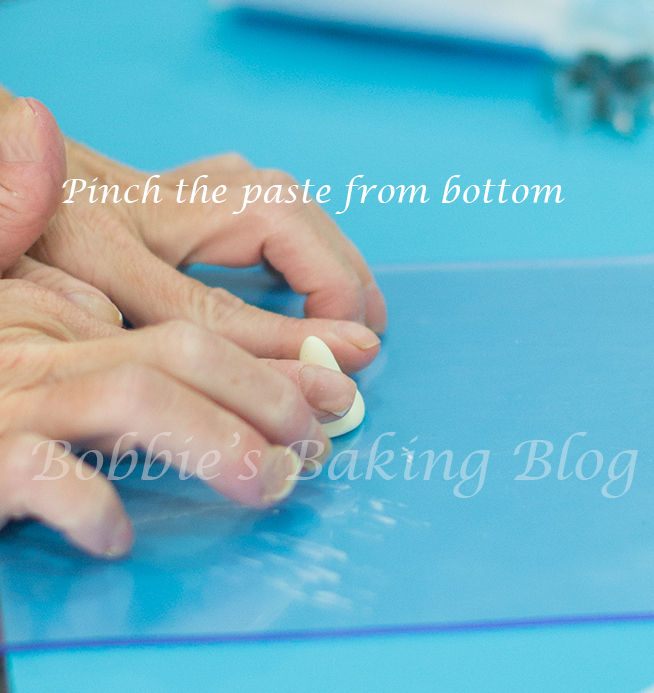 Grab prepared yellow gumpaste from under your stay fresh mat, knead until it regains elasticity. 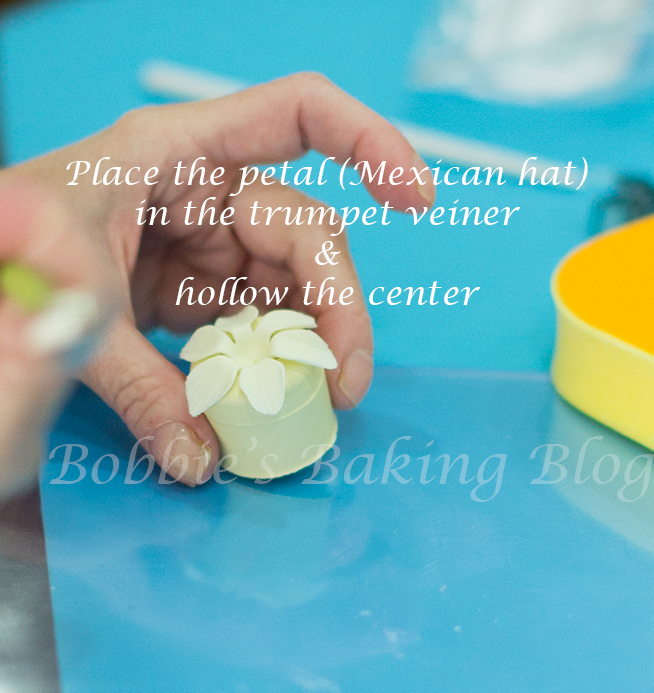 To prepare the petals we need to use the Mexican hat method, form a teardrop of gumpaste, pinch the bottom wide potion until your teardrop resembles a Mexican hat. 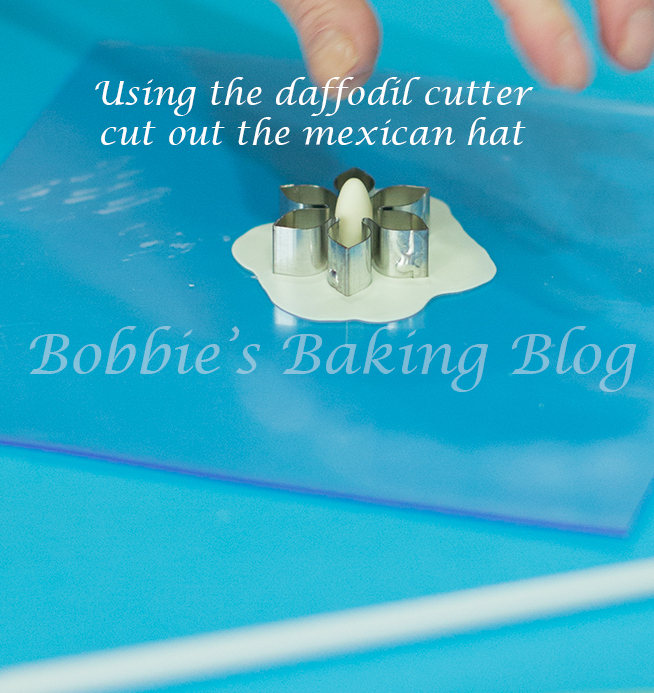 Using a celpin roll the sides thin, see through thin, once the sides are large enough to fit the petal cutter cut the daffodil’s petals, and thin the top hat portion. 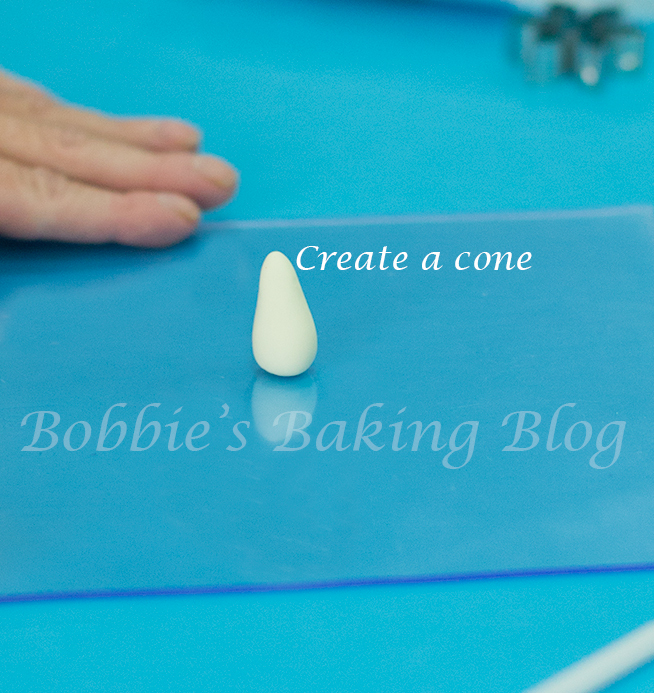 Transfer the daffodil petals to your foam, and place the thin hat portion into the one of the holes (usually these foam pads have a few holes where you can place your flowers). 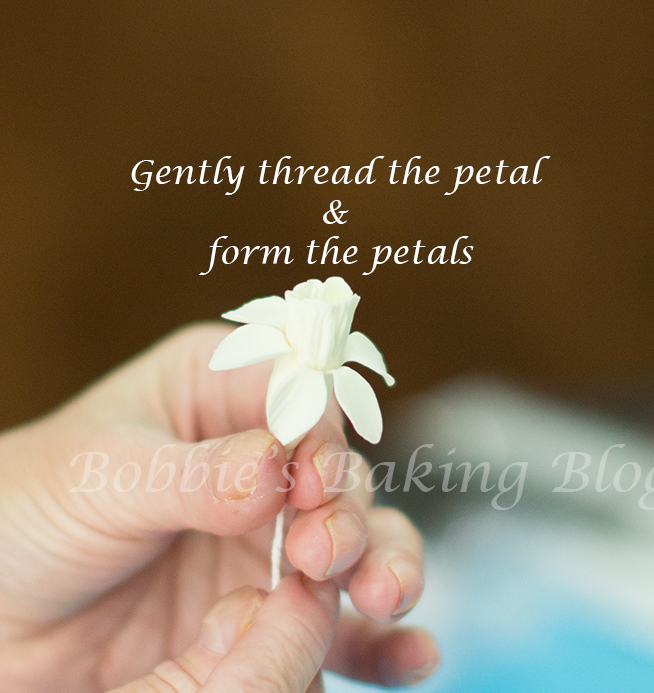 Using your ball tool elongate and frill the sides of the petals, once the petals are the length you want (the petal closed should be slightly higher than the trumpet), vein the petals with your textured celstick. 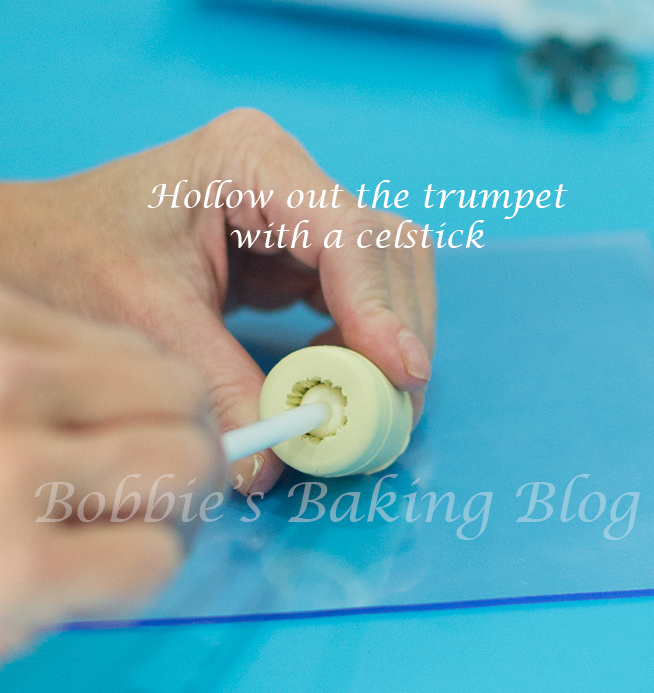 Delicately remove the petal from the foam pad and transfer to the trumpet veiner and deliberately hollow the inside of the petal, and remove the same way as the trumpet, set gingerly to the side. 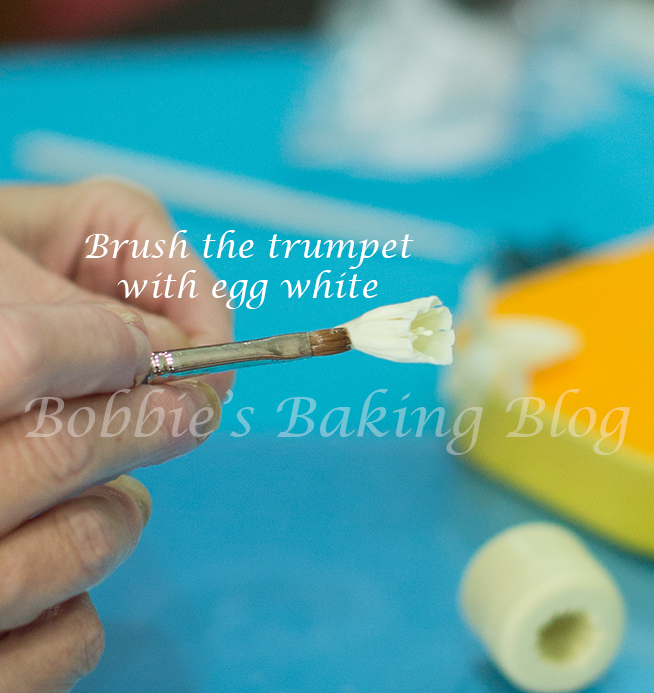 Take your trumpet sparingly brush the bottom of the trumpet with the egg white, and thread the trumpet wire through the petal. 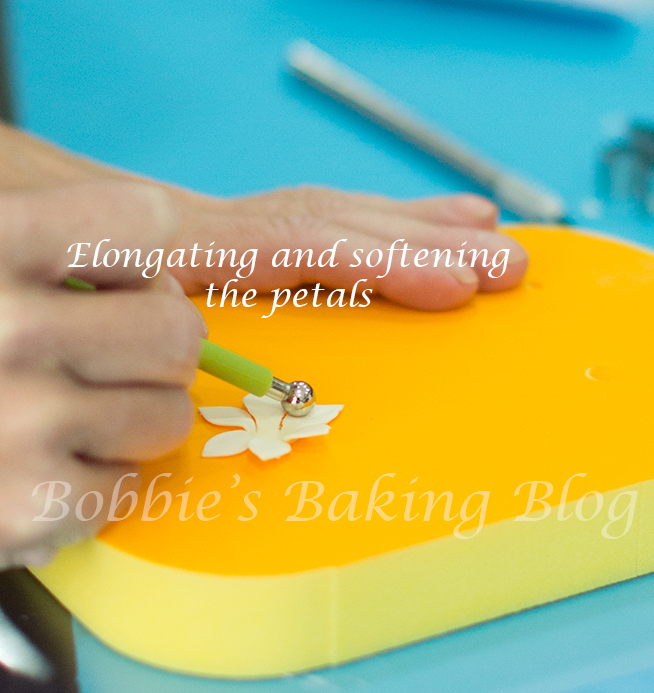 Arrange your petals, I like to close the tips slightly, and allow to dry back in the floral foam. 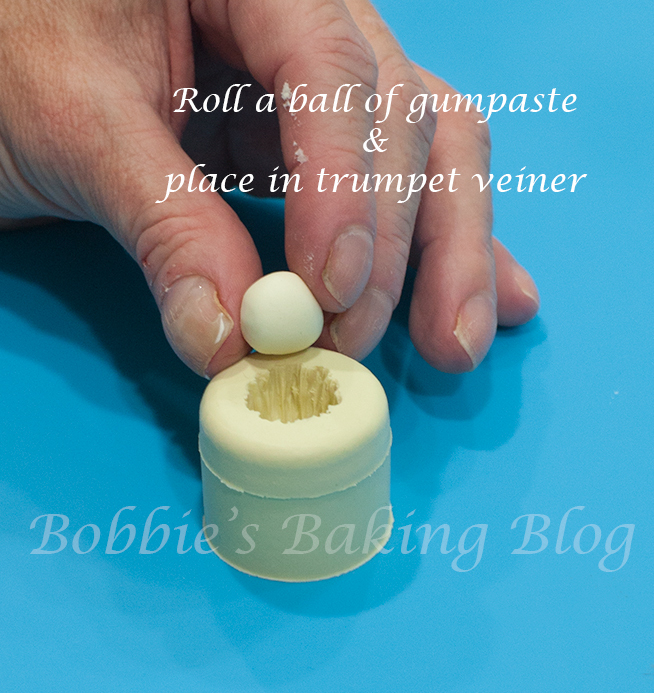 For the leaves follow the directions for Tiger Lily’s, except take 1/16 to 1/8 depending on your lilly cutter off each side, and lightly color the gumpaste light green, to create thinner leaves. We colored the daffodils with monochromatic yellows adding a burst of orange to the trumpet, and some moss green on the back of the base of daffodils. 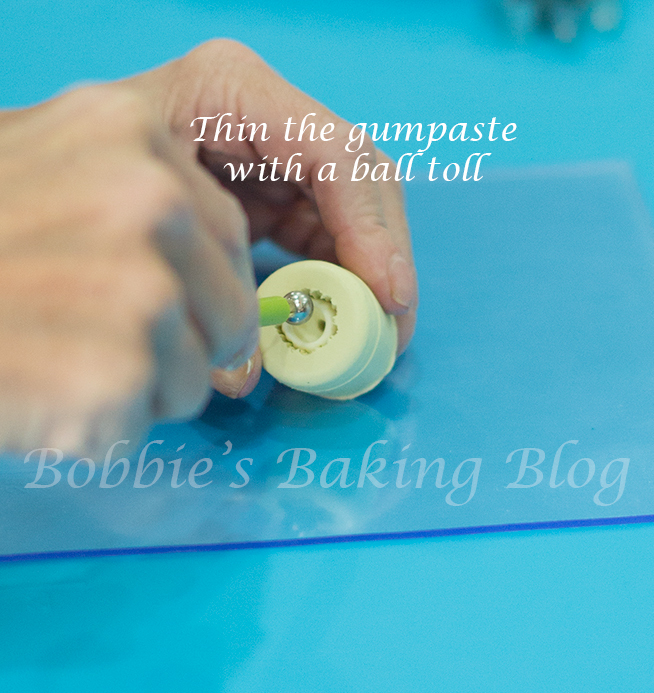 The leaves were dusted in green adding a touch of chestnut and glazed with Confectioners glaze. 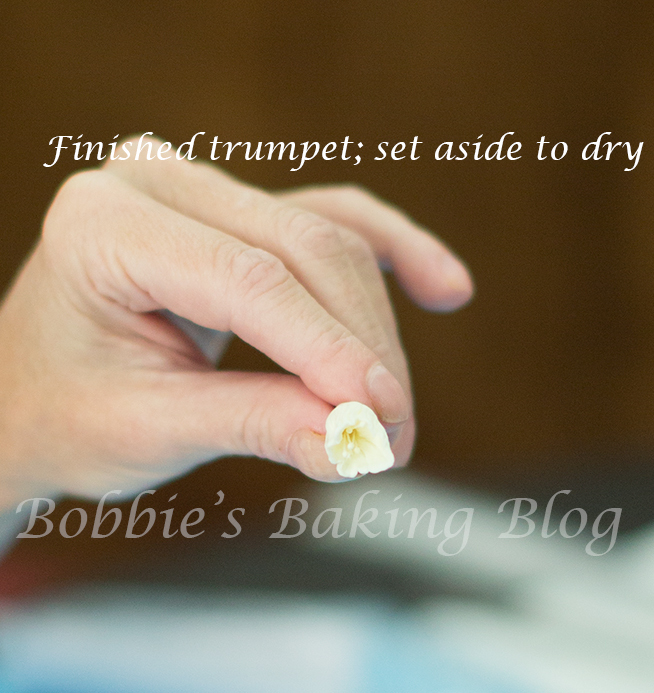 Allow the daffodils and leaves to dry over night. 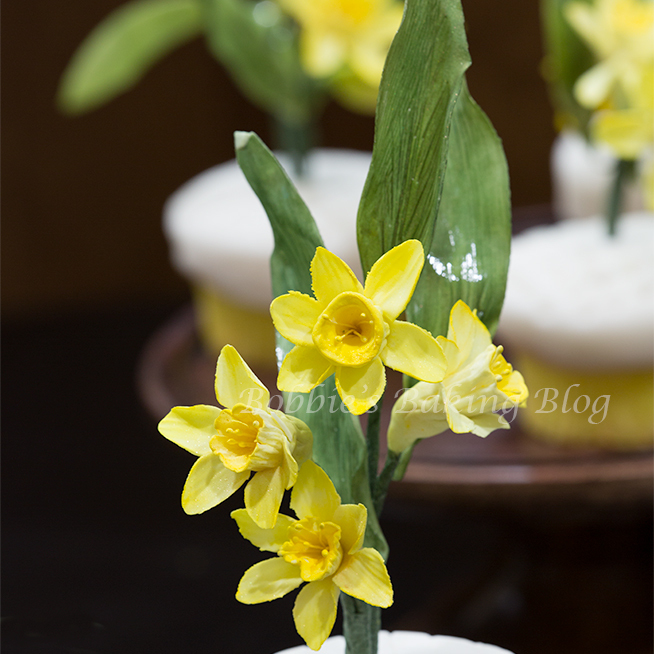 Cover the daffodils with green floral paste over the white wire, arrange 3 to 4 daffodils to 3 to 5 leaves, take care to have each flower at a different hight. Floral tape the arrangement together with green floral tape. 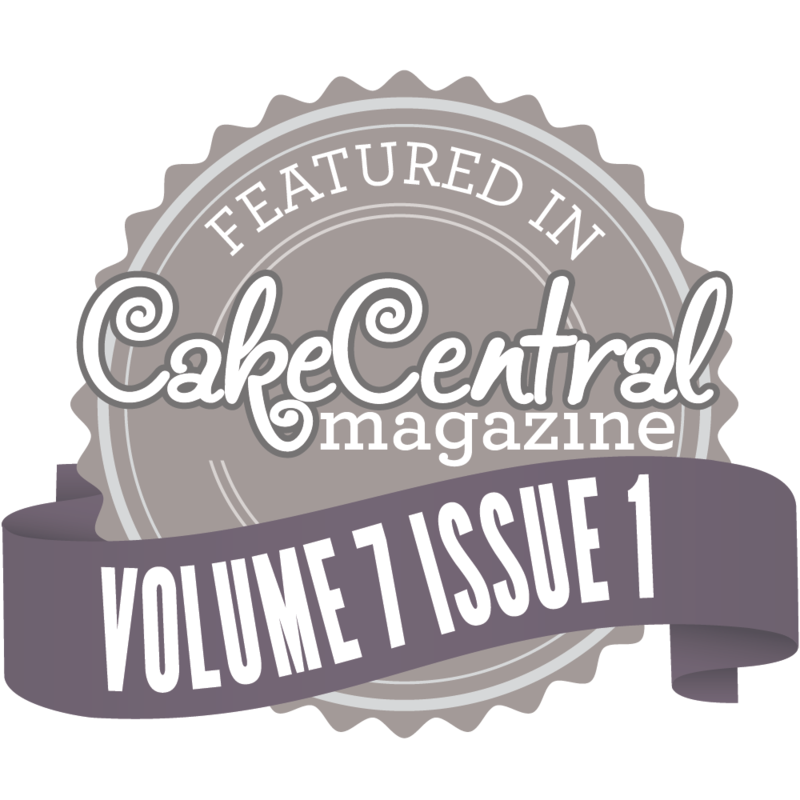 If the daffodils are going to place in cupcakes cut the wire to the hight desired and carefully put the entire wire in. 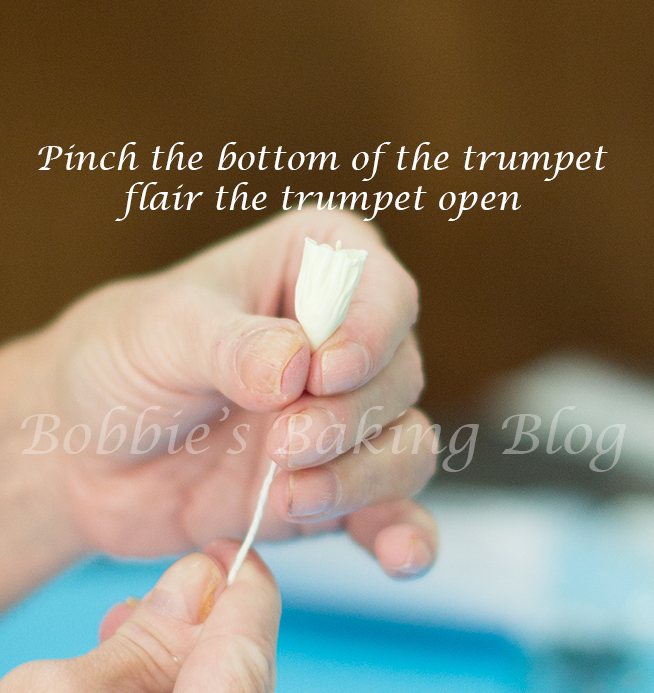 For cakes use either floral picks or use a posy pick. 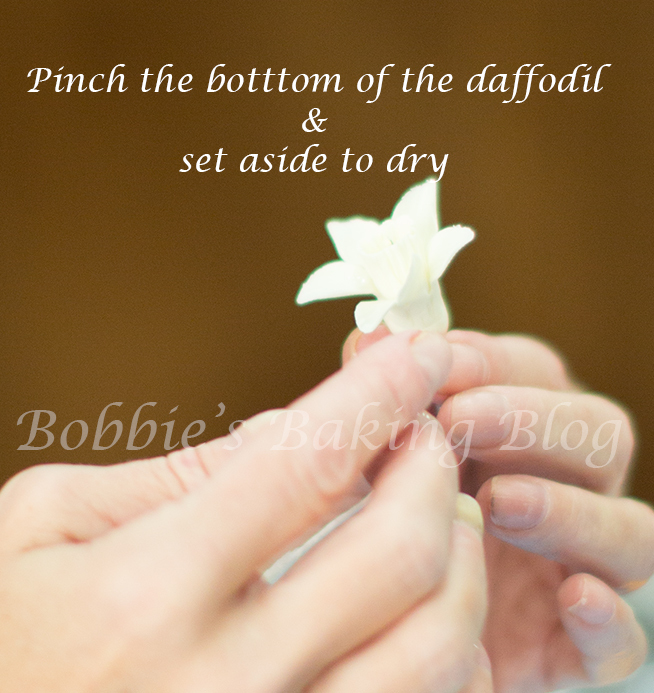 Have fun and we hope you enjoy preparing daffodils! 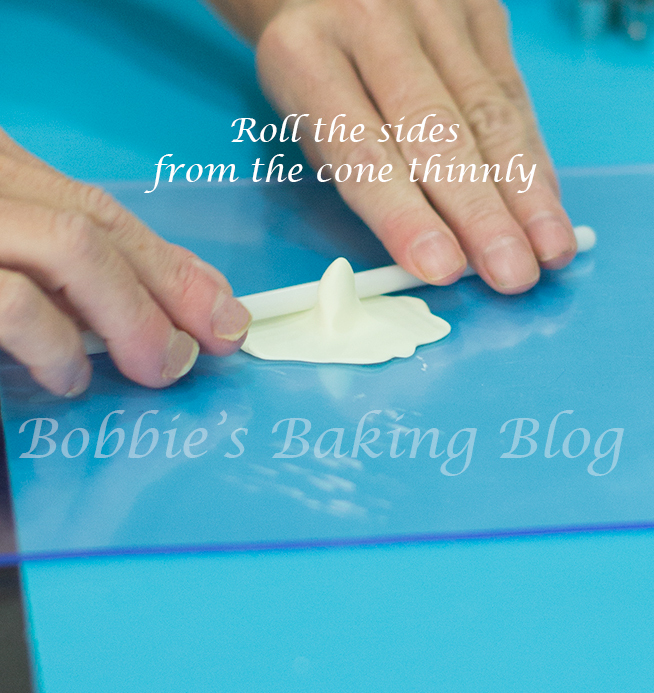 The cupcake is the vase.